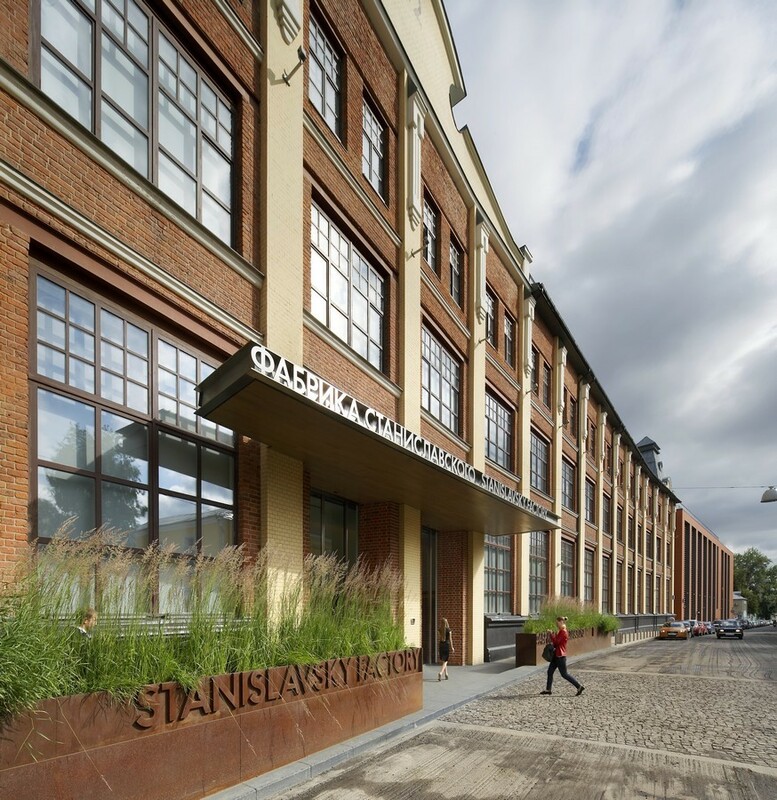 The Stanislavsky Factory is the practice’s first completed project in Moscow and has already won multiple awards, including the first RIBA Award ever given to a project in Russia. The scheme has attracted widespread acclaim and is recognised as setting a new benchmark for innovative, adaptive re-use of historic buildings in Moscow. Sensitively linking refurbished historic elements and new interventions, the Stanislavsky Factory has become a new cultural destination for Moscow. Originally developed by one of Russia’s leading industrialists and cultural patrons, the Stanislavsky family, in the 19th century, this complex mixed-use business and cultural project consists of thirteen buildings including 30,000 sqm of office space and 60 luxury apartments, as well as a hotel and restaurant. The site has an extraordinary history and includes a theatre, built by the actor Konstantin Stanislavsky, son of the original owner, and famed as the inventor of the Method acting system. This theatre is celebrated for hosting the first performance of Chekhov’s ‘Cherry Orchard’ and has been refurbished to become a new focal point of cultural activity in Moscow. The redevelopment of this site has, from the outset, been considered as both an architectural and urban landscape scheme. The project’s fully integrated landscaping – also designed by the practice – seamlessly links the constituent elements, unifying the development as a whole. 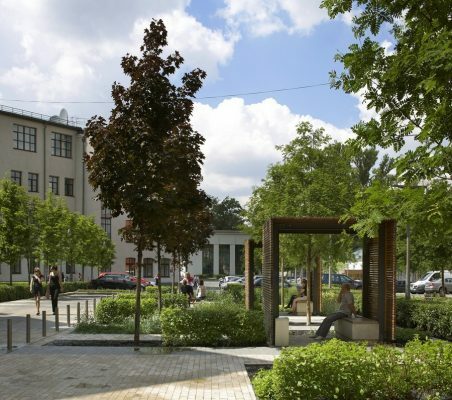 By physically and visually integrating the landscape with the architectural elements, the practice has created a socially permeable site – a completely new concept in Moscow, where the majority of developments are gated. The Stanislavsky Factory is now regarded by both Moscow planners and independent heritage groups as an exemplary innovation in regeneration, and is prompting a critical mass of high quality regeneration in Moscow’s central historic quarters. JMP’s redevelopment of the historic 4ha Stanislavsky factory and theatre site in central Moscow (formerly the home of Konstantin Stanislavsky, the ‘father of modern acting’) transformed a degraded mixture of 19th century and 20th century building stock into a vivid cultural and mixed-use development. 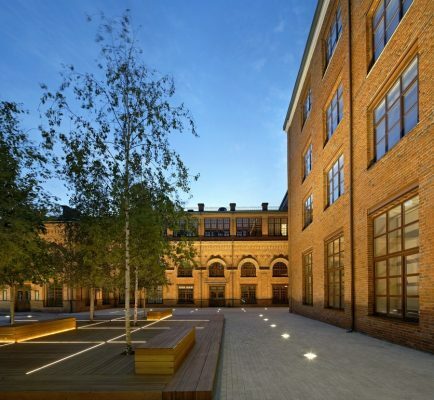 The scheme has reinstated the legendary Stanislavsky Theatre, re-modelled existing buildings, and delivered new low-rise apartment blocks, setting a new benchmark for historically sensitive regeneration. The Stanislavsky scheme is now being cited by Moscow planners as an exemplary demonstration of the fusion of old and new architecture in the city centre. 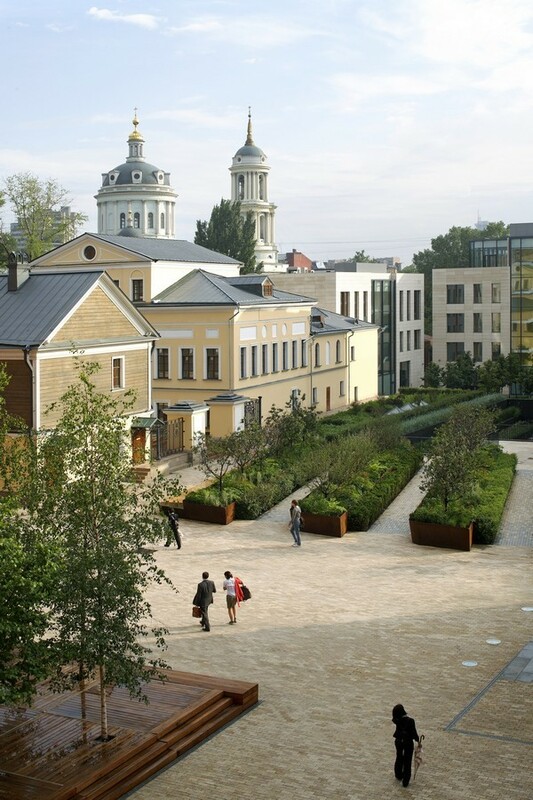 The client for this project, Horus Capital, wanted to deliver a mixed-use redevelopment for the historic Stanislavsky factory and theatre site in central Moscow that would set a precedent in a city whose hunger for urban reinvention has led to a major loss of heritage buildings and sites in the last decade. There was no existing precedent for what JMP was asked to create in 2006 when the practice was first commissioned. The Stanislavsky family established the site in the early 20th century and it was, for a time, the commercial and cultural headquarters of Konstantin Stanislavsky, the son of the original factory owners and theatre impressario. The Stanislavsky Centre brief called for a regeneration plan in which the history of the site remained evident. This demanded a mixture of restoration, repair and reprogramming for six buildings, and newbuild apartments. The Client wanted to retain and re-use existing buildings as offices, a restaurant, and hotel. A key part of the brief for the Stanislavsky Centre was the revival of the physically degraded theatre in the form of a premier arts centre. Planning constraints related to the presence, both on and off the site, of important heritage buildings. Though Moscow does not operate a British-style listing system, the big 1911 factory building along one edge of the site is, in effect, a protected structure. The client’s required newbuild low-rise apartment blocks on another site edge, and JMP’s restrained design in terms of massing and detail deferred to an architecturally and culturally important 18th century church some 80m away. There were zoning and transport strictures relating to construction access, methodology and commercial space ratios, and a requirement to de-contaminate the site. JMP also established a masterplan for services, parking, landscaping, and public and private access. Ultimately, however, it was JMP’s landscape design that added a vital coherency to an ensemble of buildings and spaces that lacked the order of a gridded plan; no two buildings were parallel, for example. 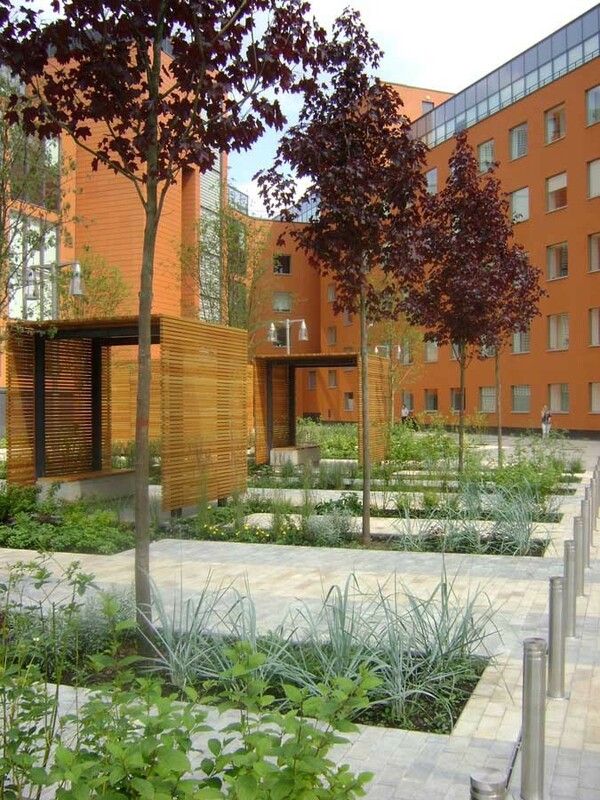 The internal garden scheme created refreshing focal-points in a coolly graphic paving and planting scheme that has not only added colour and texture at key points, but brought a return of birds, bees and other insects to the heart of the Stanislavsky Centre. The construction issues revolved around the transformation of six buildings which were in extremely poor condition. During the Stanislavsky Centre construction works, the structures of all the original factory buildings, apart from the 1911 building, were stripped back to their concrete or steel structural frames. These were then re-clad and re-serviced, with additional reinforcing elements to carry new loads and to brace the cladding. The new build apartment blocks (not yet complete) are concrete-framed and clad with dark bricks and pointing to present ‘quiet’ facades facing the historic church. The restoration of the theatre required the removal, by hand, of hundreds of badly degraded facing bricks from the main facade, and their careful replacement with newer stock. Programming over a four-year period from 2006–10 required JMP to develop the masterplan in parallel with a phased construction programme which was substantially completed during 2009. McAslan’s impressive regeneration of this quarter in Moscow has seen an important renewal of a series of buildings interlaced with fine new work to produce a mixed-use scheme. Old factories and classically-proportioned houses, Stanislavsky’s 1912 building and the Moscow Arts Theatre, these have all been lovingly repaired, re-worked and re-used. The theatre is now an arts centre, the rest are offices, apartments, restaurants and a hotel. All of this sits happily within a masterplan, also by John McAslan, which provides a gently restrained setting for the buildings new and old.